Would Carolina Lizana snicker at the thought of a Snickers bar being called a chocolate bar? Quite possibly, given that the Costa Rican chocolate enthusiast is quite particular when it comes to using that description. Lizana, with Tirimbina, which works to protect rain forest in interior Costa Rica, says many supposedly chocolate purchases made from store counters are unworthy of being labelled chocolate bars because they don’t contain what she says is the proper level of cacao needed in a chocolate bar. “There are candy bars that shouldn’t be called chocolate bars,” she says, adding that in Switzerland – a country famed for its chocolate – chocolate must contain at least 30% cacao before it can properly be called chocolate. Lizana leads tours in the province of Heredia that focus on the history of a confection that was seen as a “drink for the gods” in its liquid form by those in MesoAmerica during pre-Columbian times. In Aztec civilization, chocolate – which was then unsweetened – was a drink for royalty. The production of chocolate itself needs cacao beans, which grow on cacao trees, which are only found in the tropics. 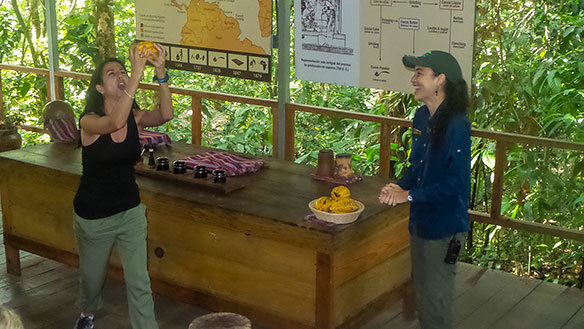 Lizana’s tours show the different steps involved in producing chocolate the traditional way, a laborious process. For instance, it takes around four years from the time a cacao seed is planted till the time the tree produces flowers. It takes another six months for the flowers to produce the fruit home to the cacao bean. Only 1% of the flowers will produce fruit. Lizana reports that 1519 saw the first sweetened cacao drink and 1847 saw the creation of the first chocolate bar. Dentists have long warned people about a downside of chocolate – which now routinely sees sugar added – but Lizana, who sports a button that says Be Happy, insists that the medical profession has concluded that chocolate has qualities that help make people happy,and indeed, doctors believe it can help cure depression. And, she adds, her tours reveals little-known facts about cacao, including that Indians in some parts of the Americas used cacao beans as a currency. Indeed, Lizana ends her tours by providing participants with small bags of cacao beans. “This is the only tour in the world that if you enjoy it we pay you,” she states. The chocolate tours are by The SarapiquiS Rainforest Lodge, which has guests stay in comfortable, circular structures with thatched roofs that resemble pre-Columbian dwellings. Guests will also find a bar, restaurant, infinity pool, gift shop, and tours of various types, including birdwatching tours. More information can be found at www.sarapiquis.com .